It has been a bit since I’ve written, but I promise it’s for good reason. I’ve been madly pumping out product sheets for Ameraguard, working on some logo options for an Ameraguard offshoot now called Defender, applying and interviewing for jobs, and trying to decide if it’s time to go back to school. SO I have not made this a priority, but here I am! AND I’ve brought you a little bit of eye candy. When we first arrived in Florida the first person to officially welcome us was the checkout lady at Publix. 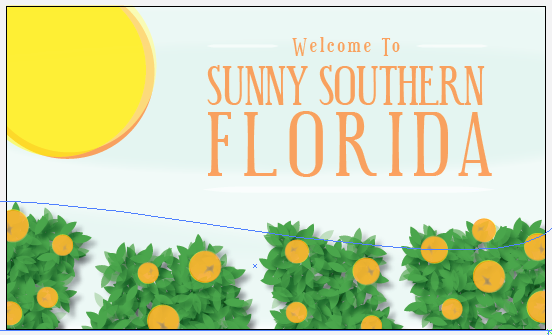 She carded me for the celebratory wine we bought, commented on the Texas ID and then said, “Welcome to Sunny Southern Florida!” That’s been my inspiration for a new little personal project. In my free time (ha! free…) I’ve been working on some postcard designs with that tag line and illustrations depicting my first impressions and experiences in Florida. After a trip to Miami beach I posted an Art Deco inspired card. The latest is inspired by the state’s favorite piece of produce – the orange. Here it is. Check back for more as I keep adding to the series.